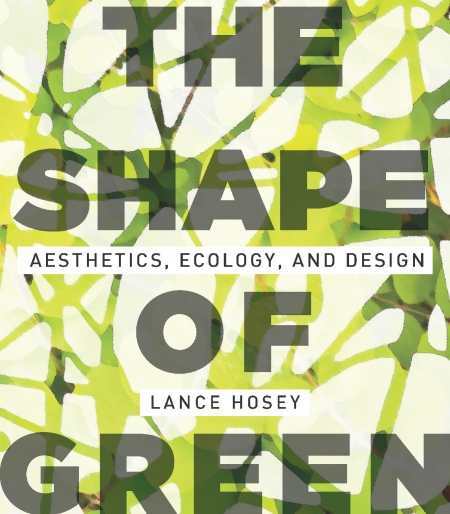 In its treatment of the aesthetics of ecological design, Lance Hosey’s latest book, The Shape of Green, approaches sustainability as a comprehensive ideal that manifests in the way humans set out to make and use everyday things. The gracefully designed and illustrated book is a pleasure for both the mind and the eyes. At the center of Hosey’s arguments are three principles aimed at guiding the problem solving inherent in making ecological design also aesthetically pleasing. To the extent that design is the giving of shape to things like cars, chairs, and buildings, Hosey’s principles of design are: “shape for efficiency, shape for pleasure and shape for place.” But Hosey’s ultimate objective is to correlate these principles to values that have specific roots in the sustainability movement. Hosey aligns his aesthetic with the idea of pleasure by surveying human sensory experience, explaining how each of the senses interact with the real world—“understanding the mechanics of this interaction better is essential to sustainable design.” At the same time, it is the capacity of the senses to synthesize experiences, allowing us to have pleasure, he argues, that leads to a sustainable, ecological idea of beauty. Hosey’s chapter on sight may very well be the epicenter of his argument. After a brief discussion of color, ending with a rhetorical question asking why color is not more of a factor in sustainable design, he moves through a discussion of shape and pattern. He arrives at an important discussion of the role of fractals, those irregular geometries named by mathematician Mandelbrot in the 1970s, that helps define an aesthetic that is truly universal, and, as Hosey asserts, natural. If there is a shortcoming to the book it is only in its lack of reference to classical philosophy. In this way, his arguments for the universality of beauty might find more resonance. Similarly, the book might place more emphasis on the cultural diversity of ideas of beauty. Hosey’s The Shape of Green will be of immense use to architects and designers as well as general readers who are seeking ways to make the planet more habitable and, in the long run, more sustainable.